For some, the 2016 SCORE-International Baja 500 was the most demanding race they’ve ever been a part of. 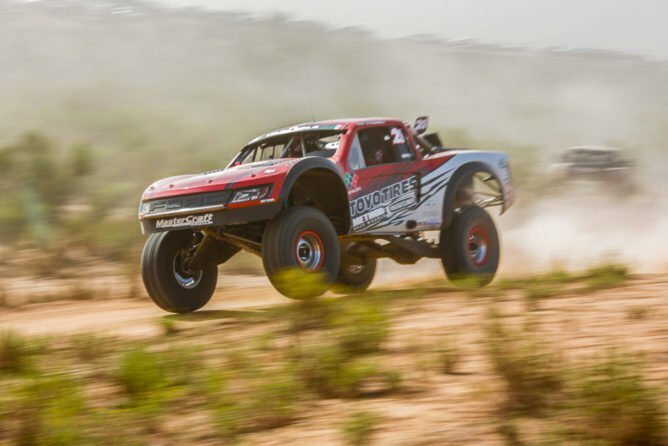 For Vildosola Racing, the extreme temperatures that plagued these racers was no match for the #21 Trophy Truck of Tavo Vildosola. 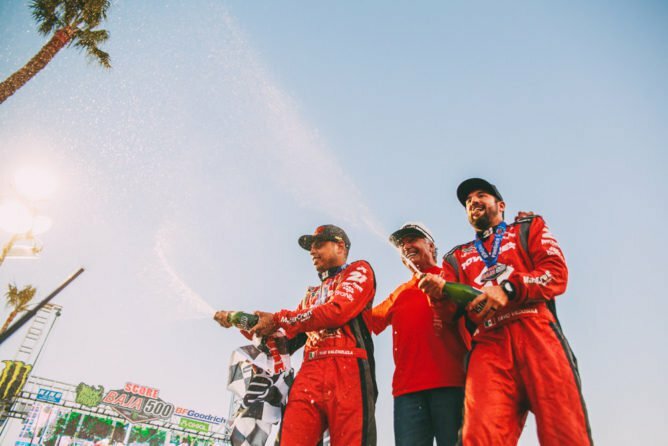 In the scorching heat pushing nearly 120 degrees, Vildosola won his first career SCORE-International Baja 500, averaging a speed of 56.86 miles per hour, three minutes faster than Rob MacCachren, and finishing in eight hours, twenty minutes and fifty-five seconds. Vildosola qualified in the middle of the pack and started in 13th position on race day. 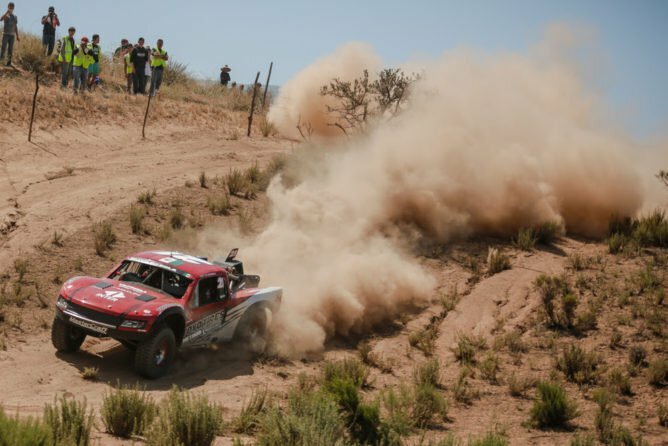 According to Vildosola, the first 100 miles were spend navigating by instruments as he continually battled through dust and lap traffic with navigator, Javi Valenzuela. Vildosola picked off a couple trucks on course, then few more in the pits until he finally reached some clean air. 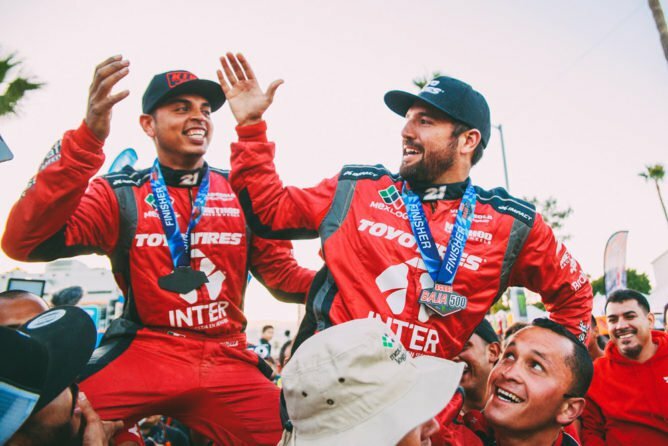 Three quick pits were his only downtimes and the #21 was the third truck to cross finish line in Ensenada, Baja California, but took home his first overall SCORE-International Baja 500 win on corrected time. Perhaps the biggest factor in the years Baja 500 was the heat. An overall scorcher, this years extraordinary temperatures made it nearly impossible to manage both your body and vehicle. For Vildosola, preparing for these situations are the keys to his success. “Winning a race in Baja requires perfection. 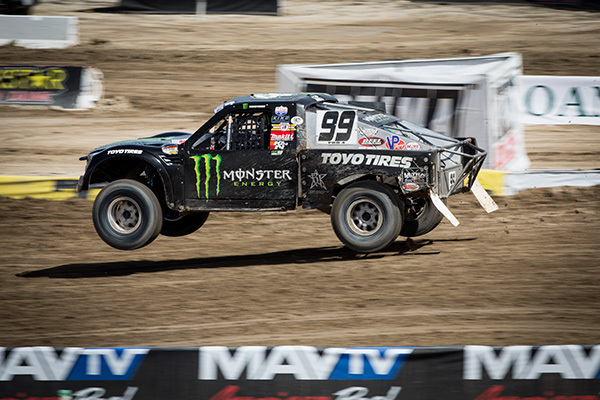 We spent significant time testing our shocks coming into the Baja 500 knowing conditions were going to be extreme. My King Shocks worked beautifully through some of the roughest terrain in the hottest conditions imaginable. 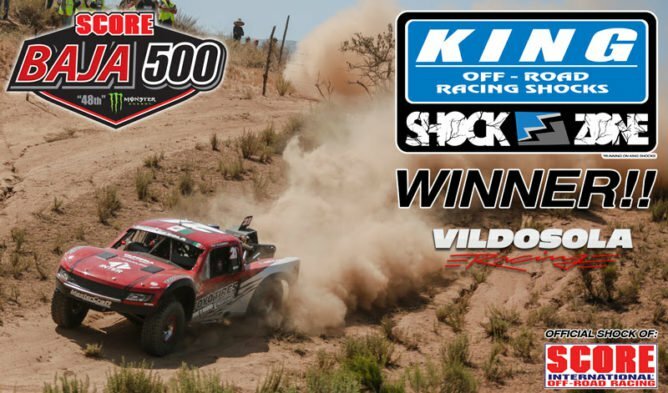 Thanks to the dedication of my team and King Shocks in preparing for this race, we were able to capture the overall victory,” commented Vildosola. Vildosola also won the King Shock “Shock Zone” Award for the second consecutive race in 2016. 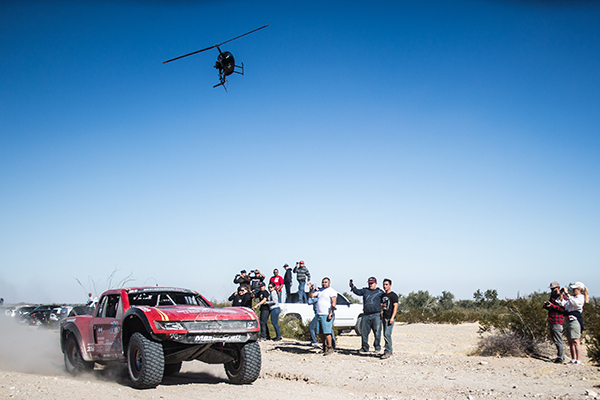 The King Shock Zone was a section of the race course from check point 2 to checkpoint 3 in San Felipe that had the roughest terrain at the 2016 Baja 500. Tavo took home $4,000 in cash and a custom trophy with the time of 00:01:43.13 around the San Felipe Loop. Ronny Wilson, with teammates Bryan and Randy Wilson, won Class 1 in his King Shocks equipped #138 buggy. Bryan Wilson started 16th off the line after the team opted to skip qualifying and had a clean run to Borrego. By race mile 200, the the #138 was the third car on course and Ronny hopped in to run the brutal San Felipe loop. “I had no issues. No flats. No mechanicals. Nothing wrong with our shocks. 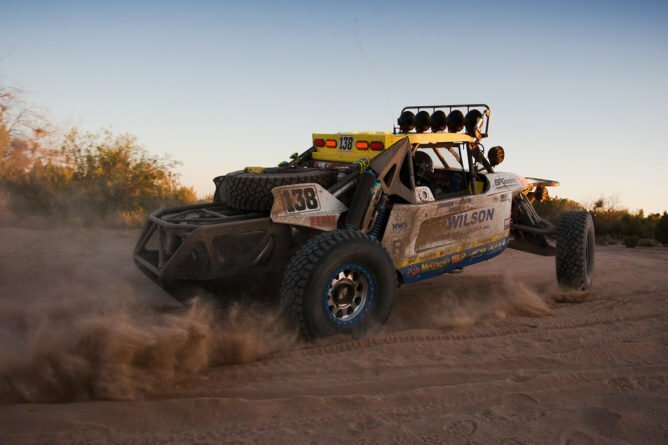 I was a bit concerned with the shocks getting too hot in San Felipe but our King Shocks had no issues all day,” commented Ronny Wilson At race mile 389, the car was handed off to Randy Wilson who was able to get by Justin Davis to take the first position on the road. Davis had started second, so the Wilson’s knew they had him on time. They drove a conservative pace to keep him behind them and crossed the finish line first with a time of 09:20:25:00 and taking first place in Class 1 and 10th overall. King Shocks would like to congratulate their other class winners at the 2016 SCORE-International Baja 500: #500 Victor Cesena/Gerardo Iribe – CLASS 5 #8036 Carlos Fonseca – HEAVY METAL #1949 Alonzo Lopez – PRO UTV #1203 Oliver Flemate – SCORE LITES About King Shocks King Shocks makes world-class desert racing shocks for trucks, buggies and UTV’s. King manufactures and hand assembles all of their shocks in Southern California. King Shocks has been the industry leader for over a decade and continues to leave the competition in the dust by providing the level of quality, performance and customer service that champions demand. About Mad Media Mad Media (www.madmedia.com) is a San Diego based marketing and creative agency, with in-house film and television production. We craft authentic, culturally engaging brand messages, and deliver them across print, web, photography, and film platforms. Mad Media has been leading the online content revolution since 1995 producing major commercial, television, online content and viral film projects such as The Gymkhana Series and XP1K Series.